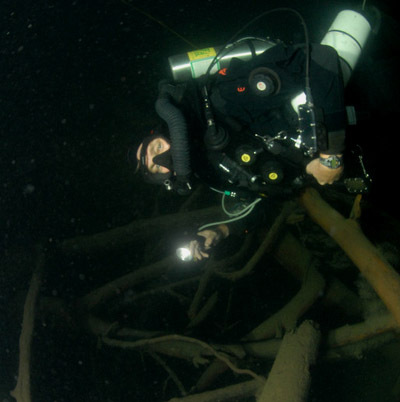 A couple of months ago, I was having dinner with a buddy of mine at Floyds Diner, a local cave divers hang out in High Springs, Florida, when the conversation of deep technical diver training came up. The dilemma of good training locations with ample depth reared its ugly head once again. Florida has a multitude of decent training locations, but most have environmental concerns. For example, there are some that the access is often closed, others are located off shore where weather and boats play a significant role making them undependable. Too, there is the issue of a full cave environment  but your students are not cave certified. 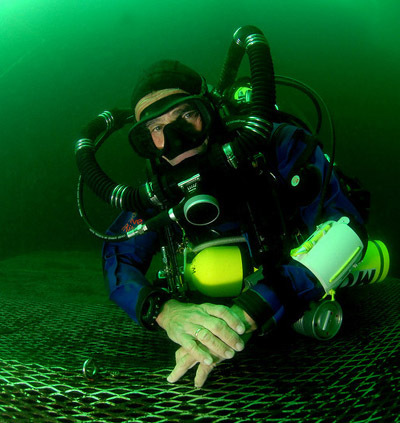 Bert went on to say that the previous owner, Hal Watts (or Mr. Scuba as he likes to be called), had leased out the Grotto along with all its buildings in the autumn of 2006 to a new company called the Commercial Diving Academy. Bert raved on for twenty minutes about all the new improvements they had done over the last year, and that it is once again an excellent location for technical diver training in a controlled environment. With my curiosity heightened, I contacted the Commercial Diving Academy upon my return to the office, and made arrangements to visit and shoot photos at the new and improved Grotto. 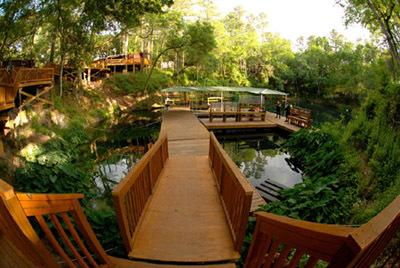 Just fifteen minutes outside of Ocala, the Grotto is conveniently located in central Florida amidst rolling hills covered with ancient, picturesque oak trees. Joining me on the photo session was a good friend of mine, Eric Osking, and Warren Stincer, one of ADMs dive assistants. As we pulled through the wooden gate of the Grotto, I immediately noticed the new and impressive dock system, cleaned up grounds, and new mixed-gas fill station. Meeting up with the Grottos manager, we were escorted to a newly renovated cabin, which contained a full kitchen, screened porch, satellite television, and a fireplace. So far everything was looking exceptionally nice, but we were here to check out the water conditions. 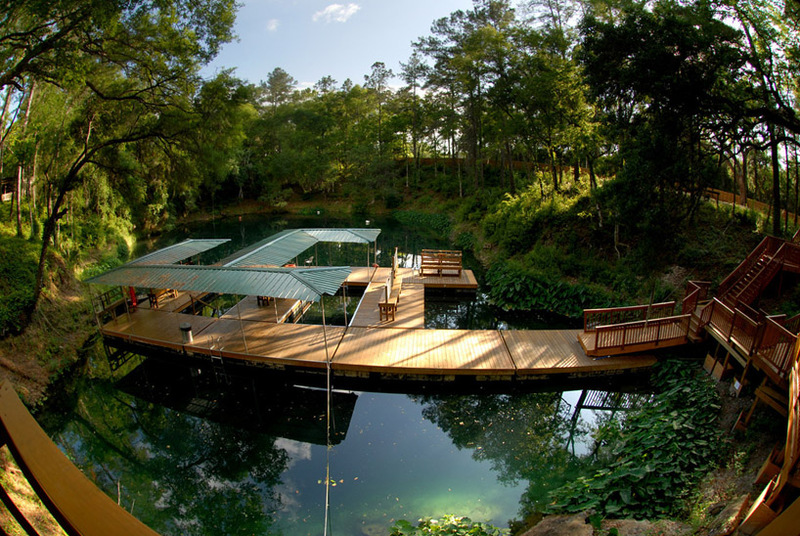 In the past decade, the Grottos visibility had deteriorated and its surface had become covered completely by a small green floating leaf plant called duckweed, making training conditions less than tolerable. Walking over to the new dock, I took my first glance down into the Grotto. Wow, was all I could mutter. The new owners had cleaned up all the old docks and installed new shade covers; but, most impressively, all the duckweed was gone. The water visibility appeared much clearer with the rays of the evening sun penetrating deep into the bluish green water. For the first time in a decade, I was feeling excited about diving the Grotto again. We spent the evening preparing our gear, and shooting some topside time-exposure images, as seen on the first two pages of this article. Early the next morning, I backed my dive trailer up to the prep dock where we organized our rebreathers, cameras, and large camera lights. It was an easy walk down the wide steps to the water and into the shallow three-foot deep staging area. Once we had all our gear and stage cylinders clipped on, a small backpedal and we were in over 100 feet of water. Descending, we passed large training platforms conveniently located at a variety of shallow depths. 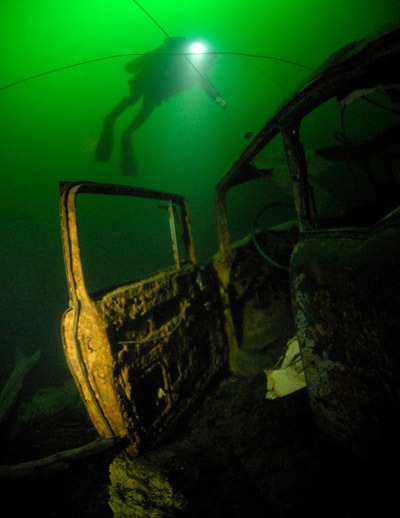 The water visibility maintained at least 30 to 40 feet all the way down to the bottom at 110 feet. 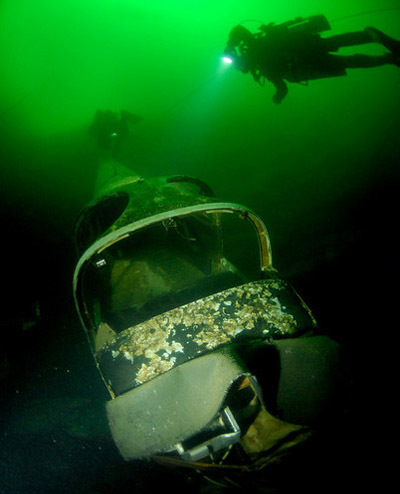 Here we discovered several items that had been placed for the entertainment of divers, such as an airplane fuselage, two-man sub, a couple of boats and cars. The Grotto has also placed guide lines for divers to follow. These guide lines will direct you to many of the more interesting items to see within the Grotto. 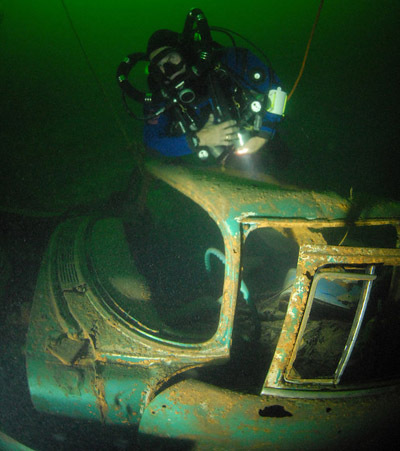 I wanted to drop quickly down into deeper water so I could check out the visibility and photograph some of the cars and vans, working our way back up to shallower water to help minimize decompression times. At around 200 feet we encountered a deep-water muck layer that decreased the visibility to only a few feet. This is often caused by rainwater run-off making its way into the Grotto. 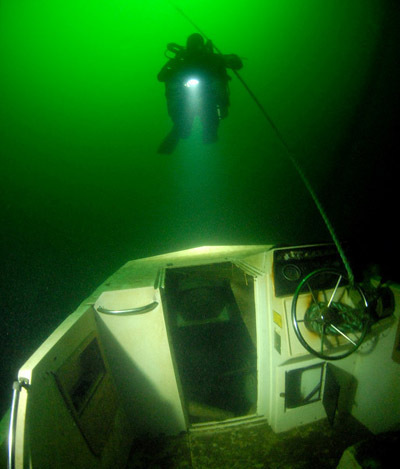 Above this muck layer, the visibility maintained between 20 and 40 feet. 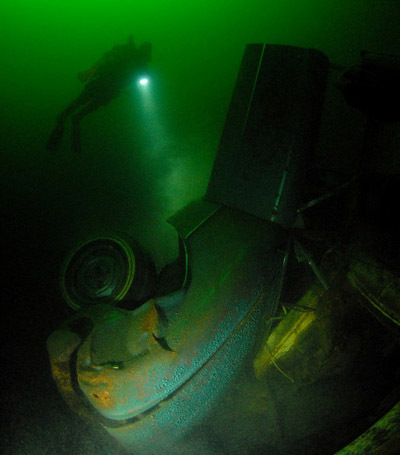 More than enough to safely conduct controlled technical diver training. Of course, water visibility will vary from month to month, depending on the weather conditions. 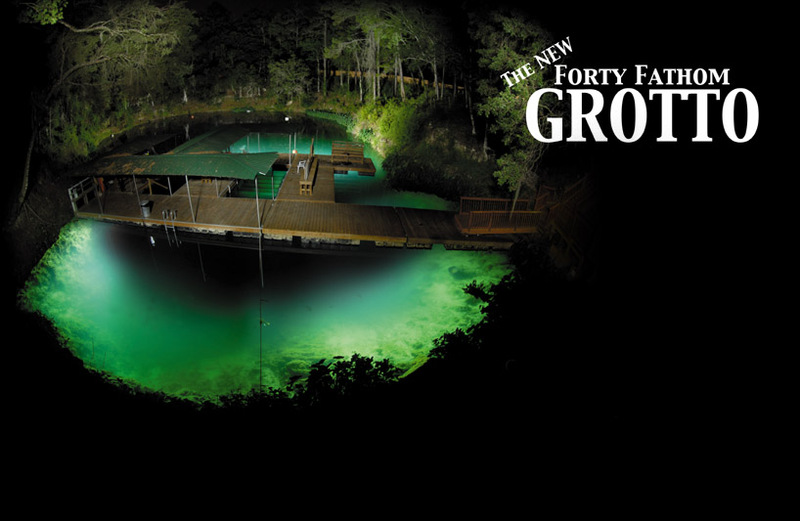 So what are the plans for the NEW Forty Fathom Grotto? According to the manager, they are in the process of completing more private classrooms, an economical bunkhouse, and recreational facilities such as a volleyball court, picnic area, additional parking, and much more. The Commercial Diving Academy has also launched its own SCUBA Training Programs offering all levels of certification, including instructor training, technical, and rebreathers. They want to deliver the best training available, and have partnered with NAUI Worldwide to produce the finest training materials and maintain professionalism. Upon exiting the gate, I was truly impressed by the countless hours of hard work, tens of thousands of dollars spent for remodeling, and true dive professionalism. If you have not been back to the Grotto in a long time, or have never been there, I would recommend dropping in and checking them out. Do a couple dives, and set it up to bring your students.